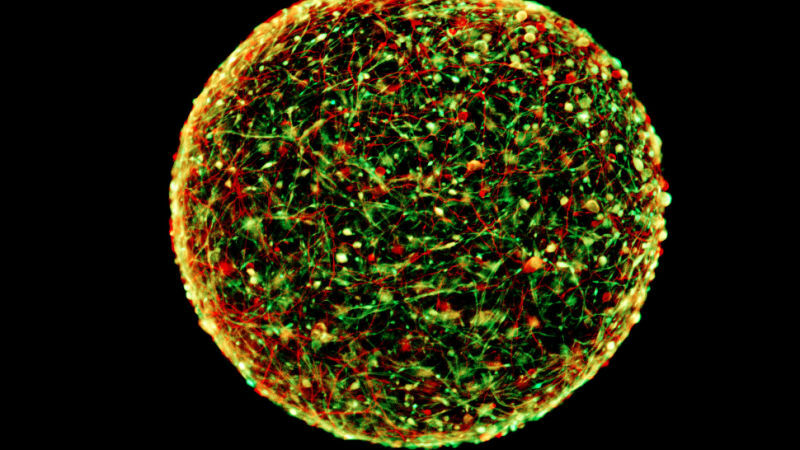 Researchers at Johns Hopkins’ Center for Alternatives to Animal Testing (CAAT) have developed a process to create “mini-brains” derived from stem cells reprogrammed from human skin cells. The resulting structures exhibit a number of cell types and cell functions of the human brain, and can be produced economically and in sufficient numbers to be especially useful for screening chemicals and drug candidates. The mini-brains will also be used to study Alzheimer’s disease, Parkinson’s disease, multiple sclerosis and autism. “[Principal investigator] Hartung and his colleagues created the brains using what are known as induced pluripotent stem cells (iPSCs). These are adult cells that have been genetically reprogrammed to an embryonic stem cell-like state and then are stimulated to grow into brain cells. Cells from the skin of several healthy adults were used to create the mini-brains, but Hartung says that cells from people with certain genetic traits or certain diseases can be used to create brains to study various types of pharmaceuticals. He says the brains can be used to study Alzheimer’s disease, Parkinson’s disease, multiple sclerosis and even autism. Projects to study viral infections, trauma and stroke have been started. Hartung’s mini-brains are very small—at 350 micrometers in diameter, or about the size of the eye of a housefly, they are just visible to the human eye—and hundreds to thousands of exact copies can be produced in each batch. One hundred of them can grow easily in the same petri dish in the lab. After cultivating the mini-brains for about two months, the brains developed four types of neurons and two types of support cells: astrocytes and oligodendrocytes, the latter of which go on to create myelin, which insulates the neuron’s axons and allows them to communicate faster. The researchers could watch the myelin developing and could see it begin to sheath the axons. The brains even showed spontaneous electrophysiological activity, which could be recorded with electrodes, similar to an electroencephalogram, also known as EEG. To test them, the researchers placed a mini-brain on an array of electrodes and listened to the spontaneous electrical communication of the neurons as test drugs were added. “We don’t have the first brain model nor are we claiming to have the best one,” says Hartung, who also directs the School’s Center for Alternatives to Animal Testing. Learn more in the video embedded here.